Light Swiss Chard Frittata – At first bite you’ll love the sweet caramelized onions, in combination with the savory flavors from the Swiss chard, eggs and cheese. A perfect meatless dinner when paired with a salad and some crusty bread. Or you can serve it for breakfast or brunch, it’s easy to make ahead and reheat before serving. I also love Spinach and Feta Frittata, Tomato and Zucchini Frittata and Bell Pepper and Potato Frittata. Swiss chard is one of my favorite leafy green vegetables and it’s an excellent source of vitamins K, A, and C, minerals, phytonutrients, antioxidants and fiber. 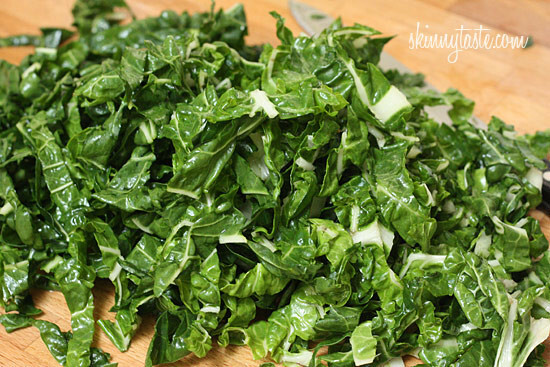 If chard is not available, try this with kale or spinach. To keep it light, I usually I prefer to make my Frittatas with half egg whites/half whole eggs but to further lighten it you can make this with all egg whites as well. Depending on how you serve this, it will serve four to six people. 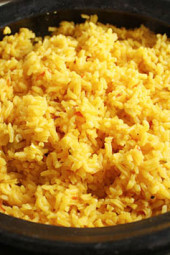 Leftovers can be refrigerated and reheated. 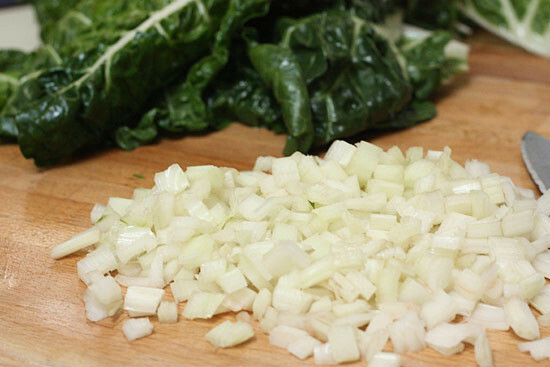 Separate the stems from the leaves of the chard. Dice the stem into small pieces. Roll the leaves up and slice into thin ribbons, about an 1/8-inch thick. Heat a 10-inch skillet on low heat; melt half of the butter and add the onions with a pinch of salt and pepper. Slowly cook the onions, stirring occasionally until the onions become translucent, about 8-10 minutes. 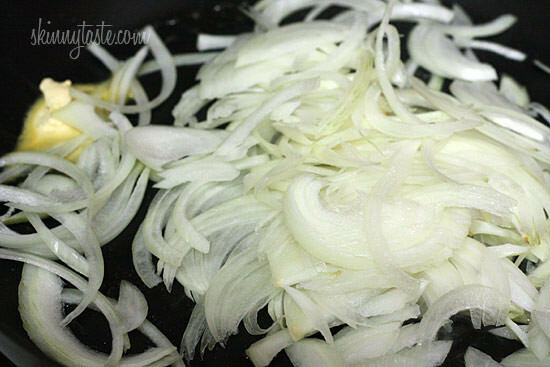 Bring the heat up to medium and cook until the onions caramelize. Set the onions aside. Increase the heat to medium-high, add remaining butter and add the chard stems. Add the chard leaves to the pan and cook until wilted, about 2-3 minutes. Reduce heat to low; pour egg mixture into the skillet and add caramelized onions, salt and pepper and mix well to blend. Reduce heat to low and cook until the edges set, about 6-8 minutes. Once the bottom and edges set, place in the oven and bake until completely set through, about 4-5 minutes. I’ve never known what to do with chard, and when I’ve made it I hated it. This was delicious! I added some mushrooms, otherwise followed recipe exactly, Will make again. Thanks you! This looks great & healthy .. One should really think about eating healthy is this fast moving life.. Lisa lampanelli weight loss an motivational successful experience with weight loss surgery. Substituted Chard for Spinach. Add Tomatoes, used an onion powder instead of onions (like onion flavor, not an actual onion), Used Swiss, Parmesan, and Sharp cheddar. This was awesome thanks for the idea!!! I first tried Swiss chard after buying it at the Farmer's Market last summer. I loved it! Then I tried kale, and discovered that it was very good, too. I like that Swiss chard doesn't taste "green" like cooked spinach dishes. This looks delicious! I'm wondering if you've ever done a crab and swiss quiche? I'd love to see that! What do you do with all the yolks you must have left over from all your recipes? Just curious since I am trying to eat healthier and don't care for eggbeaters? I combined this recipe with the Crust-less Zucchini Pie and it was amazing! I used 12 oz of shredded zucchini (water sqeezed out), and substituted Monterrey Jack cheese for the Swiss. The Zucchini Pie calls for 4 eggs, 2/3 C milk, 1/2 C flour and 1t baking powder. Put the grated zucchini in a greased pie plate with the shredded cheese. Then follow this recipe carmelizing the onions and wilting the chard, put them on top of the zucchini and cheese, then mix all the other ingredients and pour into the pie plate (just bake it at 400 degrees for 30 mintues instead of cooking it on the stove). I added 1/4t nutmeg and a dash of corriander and some fresh herbs. Wonderful…will make again soon! 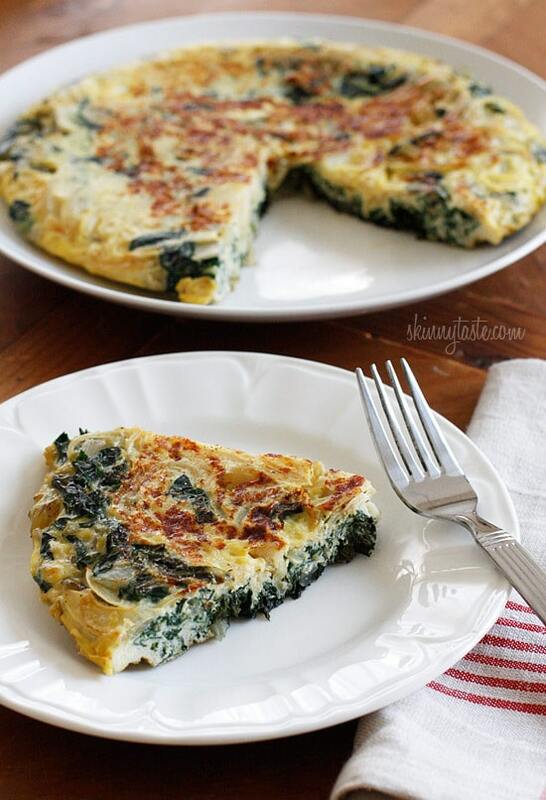 WOW… made using dandelion greens and herbed goat cheese… fabulous!!! Are rhubarb and chard the same? Was going to use stems from red chard to make strawberry rhubarb compote….if this won't work, please let me know. I've just ate it and it was delicious! and so easy too! I made this and didn't really like the taste of the chard. I think I used red instead. Maybe that's why. Mine didnt stick together…it ended be up being pieces of frita….do i need more eggs next time? I just want to say that this website freaking rocks! I have finally found the recipe website I have been looking for!!!! I have the frittatas down pat, but I'm loving the "pie" aspect. Seems like it will create a whole new texture. Thanks Gina!! I made this dish on Sunday and it was wonderful I will make it again I am sure. I'm confused about the eggs (I'm easily confused)- does it mean 4 eggs total including the whites OR is it 4 eggs & whites PLUS 4 addt'l egg whites? I made this over the weekend. O.M.G.! I made them as muffins and they are delicious!!! Even picky husband likes them. Great recipe Gina! Hi Gina! I'm a little bit confused at present about the Points Plus value of this recipe. I plugged it into my Weight Watchers online recipe builder and even with regular butter 6 servings are only 3 points apiece. I can get 4 servings for 4 points apiece. Did I do something wrong? Or is this just my lucky day? Thanks and great blog!! this looks delicious.. am going to make it today. thanks for sharing. Made this for brunch this weekend – another delicious and perfectly written recipe – wouldn't change a thing! It was great reheated in the microwave too. Thanks Gina! I'm so happy you all enjoyed it! I made this for our meatless dinner on Friday and my husband was rather surprised how great it tasted. Neither one of us have ever had Swiss chard and it was great. I used the rainbow variety of Swiss Chard. I made this for brunch today, using kale. It was great, and I'll definitely be making this one again! 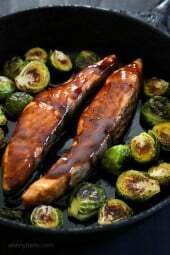 I made this recipe tonight and love it! The only thing I would do different is top it with salsa! I'm thrilled that I found your site. I LOVE it and plan to use it often! Thanks. I LOVE your frittata's, Gina! And all of your recipes, for that matter. I made the mushroom one over the weekend. I loved it, as did my partner (who is a big guy who loves to eat a lot of food!). Thank you for all of your wonderful recipes and for inspiring me to reach my goals! I can't wait to make this with the Swiss Chard from our community garden. Sauteing it is good but something different will be nice! Gina, I made this tonight using just egg whites. One of the tastiest recipes in a long time. Even hubby's who is a meat and potato guy loved it. Came across your blog last night. I look forward to using other recipes. Thank you. This is on my "to make" list! I tried again and this time it worked without a URL. I am anxious for summer and Farmes Market to try this. It sounds delicious. There's a wonderful book called Greens Glorious Greens with recipes for all kinds of greens. It's by Albi & Walthers. If you want to add more greens to your diet it's a good resource. To the lady without an oven-proof handle on her pan, Rachel Ray says you can wrap the handle with foil to keep it safe. I've tried it and it works for me. Gina, I've been lurking around your website for weeks but have never commented. I've never cooked with chard and recently bought some at the local farmers' market. I was wondering what to do with it, and then I checked your site and –voila! –this recipe was on the home page. What perfect timing! Love your recipes! Hi Gina, This this recipe a quiche without a crust? Are they interchangeable? I'm eating you baked zucchini sticks recipe right now. The only difference is instead of cutting them into sticks, I've cut them into rounds. So yummy! Made it the night before with spinach. Reheated for breakfast this morning, and it tasted GREAT! Some could appreciate a "light" recipe for a frittata. Thank you for sharing. Love your site! Your recipes always use ingredients that are easy to find here in Canada. Thanks!!! 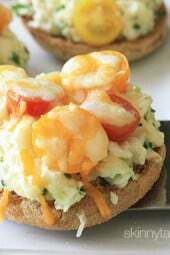 Can I substitute egg beaters in this recipe and how much would I use? This looks fantastic and guilt free, I'll have to slices please! What if I don't have an oven-proof skillet? My Italian Mom often made Fritata entirely on stove top, and I usually do, too. 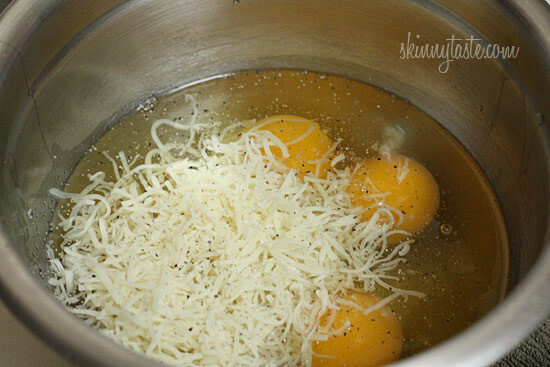 After adding the egg mixture use a spatula and gently push in the eggs as they set, thus allowing more of the uncooked eggs to flow into the pan. Once the eggs have mostly set, top with a plate, quickly flip over, and slide from the plate back into the pan to finish the other side. Sounds complicated, but it's not. This is just perfect I picked some up from the store thinking I hadn't had any in a while and now I have a new recipe to try it in. Cannot wait!! I accidentally bought collard greens, will they work in this recipe? I have never eaten collard greens or chard so I do not know how they compare or not! Have chard in the garden that made it over the winter. I'm going to make this for dinner! Thanks! Wash the chard in hot water. It really helps to get rid of any grit. Chard is much nicer than spinach! This looks great; I am a huge fan of swiss chard! 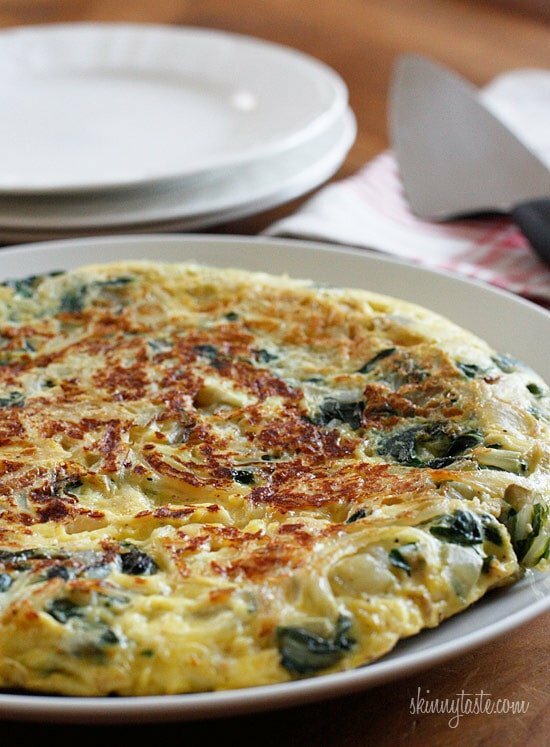 I got some Chard and some Kale in my veggie box delivery today – so your recipe for the frittata is a perfect way to try it…. Is a nonstick pan required? I think my nonstick is not supposed to go over 350 degrees. This is such a yummy looking recipe! Would this frittata be okay refrigerated and then taken in lunch box if kept refrigerated then reheated? I am going to be working part time and am looking for some meatless lunch ideas. This looks wonderful, but not something I could make for my picky family. This is great refrigerated then reheated. Also, if you make 4 servings instead of 6, it's only 5 points plus. Swiss chard is not as bitter as Spinach, in my opinion it iis my favorite of all the leafy greens. Thank you, Gina! I can't wait to try it 🙂 I discovered swiss chard at the farmer's market last spring and have been loving it since. I'll have to give this a try. I've always wanted to try swiss chard but if it tastes like kale it might not fly so I'd maybe sub spinach if I didn't care for it the first go round. I like recipes that nudge me to try something I've pushed to the back of my to try list! Take a chance and try it. I bet if you made this recipe, you would love it! If you never try it, you will never know! How can I get a printer friendly copy. When I clicked on printer friendly it said I needed a URL. I tried all their suggestions, but none of them worked. I am not sure what this is. I love it that you use the chard stems (I always do). Hate to see them go to waste as in most recipes. I look forward to trying this… maybe tonight! Thanks. Thanks Linda, I read the stems of rainbow chard get tossed since they are much tougher. Thanks for the great idea! Looks delicious! I adore frittatas. They are one of my favorite lunches! What does Swiss Chard taste like? Last week I had kale for the first time and loved it – but I hate the taste of cooked spinach (which is what I thought all cooked greens tasted like). Swiss chard tastes very different than spinach. I just love it! They all have slightly different textures and flavors. You will love Swiss Cahrd! my order of preference 1st Swiss Chard, 2nd Kale, 3rd Spinach. Chard is like kale, like spinach. What is Chard and what could I substitute for it? In Australia chard is better known as 'silverbeet'. i make a similar frittata and use spinich. any dark, leafy green will work well!